We provide talent development and consulting services that enlighten, empower, and engage employees to achieve organization excellence! “We hired Don to conduct BIZ WIZ training for key employees. The results were outstanding. Training was well planned and scheduled, completed on time and followed up by Don. I also reviewed Don’s programs for new facility start-up training and was impressed with the quality of this training." ~ D. A., Sustainability Mgr. Discover the Magic of BIZ WIZ®! The Business Education Program That Transforms Employees Into Business Partners. Welcome to BIZ WIZ®! We appreciate your interest in this exciting and proven program. BIZ WIZ® is the best choice to educate your employees about your organization and how it operates as a business. BIZ WIZ® participants gain a deeper appreciation that their future depends upon the success of their business. Understanding this common bond and valuing each person's contribution is a powerful force that enables your entire organization to excel. 1. 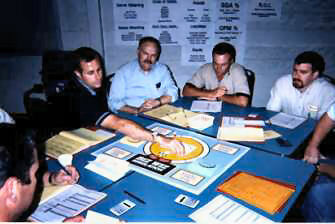 BIZ WIZ® Universal - A general program with self-study reading, classroom discussions, exercises, and the unique BIZ WIZ® Simulation. 2. BIZ WIZ® Simulation Seminar - A classroom-only program with short presentations, classroom discussions and exercises, and a special focus on the BIZ WIZ® Simulation. 3. BIZ WIZ® Custom - A customized program incorporating self-study material, classroom discussions, exercises with your real numbers, and the BIZ WIZ® Simulation. Discover all these choices in the explanations that follow. The success of a business depends upon its people. Do you agree? If so, you'll want BIZ WIZ® for all your employees. Higher performing firms invest strongly in developing their human assets. That education must include basic business knowledge. It's a fact, that when everyone on the payroll understands how the business works, they make that business work better. How can employees become business literate? 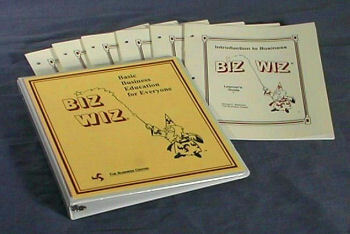 They do it through BIZ WIZ®, the premier basic business education program. BIZ WIZ® provides a practical, bottom-line education that enables all employees to recognize the importance of their actions in boosting sales, reducing costs, and using resources effectively. Teamwork, commitment, and initiative all get a lift from BIZ WIZ®! Take a moment to learn how you can transform your firm through BIZ WIZ®'s self-study reading, classroom discussions, business simulation, customization assistance, and trainer training. Discover how this simple, economical, and flexible program can enhance your organization's performance. Questions at the end of each chapter focus learning and provide a basis for classroom discussions. You can customize the program through special questions that allow you to add information about your organization. A thorough leader's guide makes facilitating classroom discussions easy. The BIZ WIZ® Simulation delivers a high-impact learning experience. A reusable board and card decks (not expensive computers) allow pairs of participants to run their own companies in competition with each other. Companies keep their own profit and loss statements and balance sheets with materials in a consumable company kit. They make decisions on how to raise and invest capital to improve financial performance. The Simulation makes learning both fun and lasting. You can use the Simulation with all the versions of BIZ WIZ® or as an independent tool for knowledgeable participants. Four years of simulation play cover the full economic cycle of growth and decline (fewer than four years can be played). Each year requires about 1 1/2 - 2 hours to complete. The first year is divided into rounds that match the self-study reading. An excellent leader's guide provides full support for administering the BIZ WIZ® Simulation and guiding learning reflections. Select the blend of exercises you need, add your own firm's financial information, and get participants immersed in your business. Leader's notes are available for each exercise. You may also select reusable wall charts to assist with your sessions. Optional customization assistance and trainer development are available to create the perfect program. Customization service can include incorporating company-specific information into self-study materials and adjusting exercises. 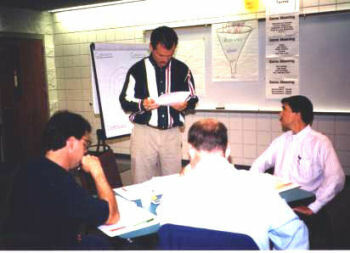 Train-the-trainer workshops cover both training techniques and financial concepts. Trainer practice and pilot sessions can also be provided to assist your implementation. "I know a lot more of 'why' and 'how' we do certain things. It makes me realize, as an employee, how important my job is." BIZ WIZ® is a registered trademark of The Business Center.